Why Grace Young thinks a wok cooks the ultimate stir-fry. ?My mother was raised in Shanghai and my father in Guangzhou, but by the time they started their life together in America, in 1949, they no longer cooked with a wok. Round-bottomed woks, the only kind they could find, didn’t get hot enough for stir-frying on their all-American electric range. So they resorted to a stainless-steel skillet for Chinese cooking. My father lamented as he served his exquisite, fragrant dishes that the food hadn’t been “properly” stir-fried. It wasn’t until years later when I discovered the carbon-steel flat-bottomed wok and made my first successful stir-fry, a simple cashew chicken, that I understood my father’s concern. I still remember it vividly. The moment I swirled the peanut oil into the preheated wok, it shimmered. With the minced ginger, the carbon steel hummed and crackled, releasing a gingery-lemony perfume. The marinated chicken lent the wok music a steady sizzle. After searing undisturbed for a minute, the chicken, to my amazement, yielded to the metal spatula without a hint of sticking and, after a quick stir-fry, achieved a perfect golden hue. Growing hungrier and happier, I added a touch more oil along with sugar snaps, carrots and roasted cashews. Within a few strokes of the spatula, the sugar snaps turned bright green. I added a couple spoonfuls of rich chicken broth, a splash of rice wine and soy sauce. Stir-frying the mixture until the vegetables were crisp and tender, I could feel myself bonding not only with my wok, but with the hundreds of years of tradition that had produced such a simple, healthy and elegant cooking technique. The chicken that evening possessed the concentrated caramelized flavor and seared aroma known as wok hei that the Chinese prize. The vegetables were exquisitely sweet and crunchy. To this day I marvel at the natural nonstick quality of a seasoned carbon-steel wok, which is what makes it indispensable for stir-frying. For over 2,000 years, the wok has been the essential tool in the Chinese kitchen—it is the original natural nonstick pan. Once seasoned, just as with a cast-iron skillet, its surface acquires a nonstick patina. The more it is used, the better the patina and the less oil the carbon-steel wok requires. Nutritionally, a carbon-steel wok imparts some dietary iron into food and cooking quickly at high heat preserves such delicate nutrients as vitamin C and folate. But what home cooks praise the most is that it imparts the coveted wok hei to stir-fries. Despite all those benefits, the carbon-steel wok is becoming increasingly difficult to find. On a recent visit to Philadelphia’s Chinatown I went searching for a carbon-steel wok, but could only find nonstick cookware. In fact, the only place that had one was a cookware store in the Italian section of town. And in China, too, in urban centers, I’ve observed that “modern” nonstick cookware has usurped carbon-steel and cast-iron woks. But nonstick is just not the same; it’s not safe to use traditional Teflon-coated nonstick pans over high heat because it may cause the coating to break down and release potentially toxic fumes. And most nonstick pans don’t last. Food stir-fried in a nonstick pan is devoid of the coveted browning and seared fragrance a carbon-steel wok imparts. As a Chinese American, the looming extinction of the carbon-steel wok makes me sad. I’ve been called the wok evangelist, the stir-fry guru and the wok doctor. When I travel, I carry my wok onto flights, subjecting me to enhanced scrutiny from Homeland Security. But when I lecture and teach, my wok is at my side—or on the flame and I can be sure that every time I stir-fry in my wok, I’m going to get that magical aroma and sear that would make my dad proud. Grace Young is a three-time IACP award-winning writer, including the Jane Grigson Award for distinguished scholarship. 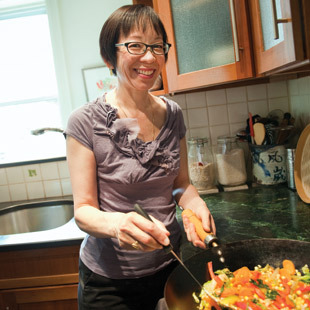 Her most recent cookbook, Stir-Frying to the Sky’s Edge (Simon & Schuster, 2010), won a 2011 James Beard Award and was a finalist for the IACP International Cookbook Award. She lives in New York City.